Good morning & have a super Saturday! And those who made a telescope found themselves new careers. The clusters set up in the sky, make shapes like a MONKEY. I’ll take two of these myself”, one says with no remorse. And so the star gazing phenom was said to have begun. Today’s words weren’t a challenge, maybe MUSSEL carried some weight. 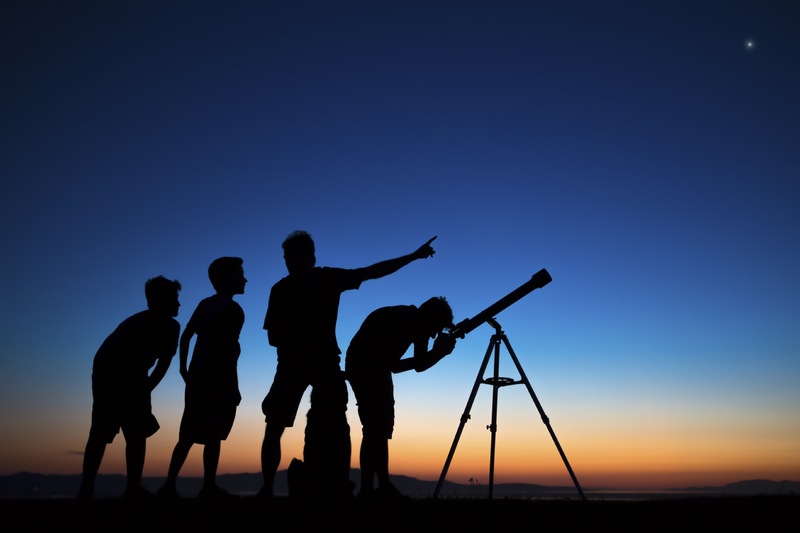 GAZING at our cartoon, we see a GROUP of men, in awe over the new TELESCOPE. It’s said that Galileo was the first one to point a telescope UPWARD, and one of the men looking out the window is saying, “Point it there”, while pointing upward. Hmm. Exactly what’s UP here? Are we in America? Are we in Europe? It’s all UP in the AIR to me! Did Jeff PLANET to be confusing, or am I just off PATH here? SIRRIUSly, I’m having HUBBLE trying to FOCUS on this! Is it NEWTON, perhaps? I can’t FIGure this out! Anyway, business is booming, it’s..”LOOKING UP”! MERCURY, MERCURY, ME! Great pun! Ok, I’m going for the eye candy. I like the price tag on the floor model. I like the little bow in the owners hair. I like the detailed lace collars. But you know what’s really OUT OF THIS WORLD? The guy by the window? Where are his legs? Is he sitting on the sill? What on EARTH…? So, there you have it, Folks! Done! Well done Angela. The SKIES the limit today. Piece of cake. Chilly in the Great Northeast. SKIES the limit today. Well done, Angela. Mike found the problem. It was good Detective work. Back at ya, Cara Mia. Somehow muscle came to mind,but mussel did not.I could see up was the second word for the puzzle so the u had to be the second letter,so mussel finally clicked in. You have good mussel memory, Angela. ROTFL! You’re a sick puppy, Steve! I SHELL remember what you said! Angela, thank you! I always thought it was Galileo who invented the telescope and you were confusing it with Van Leeuwenhoek’s microscope (or using poetic license to fit your post), but you are absolutely correct! I learned a new science fact and my wife’s car passed its smog test – a good day so far! PS – What’s up? VENUS rose at 6,03 AM PDT. The Morning Star with sunlight in its hair. Thanks for the Frankie Avalon memory. Good morning. Quoting from another. “Easy Breezy”. No problem with either the puzzle or cartoon. I answered Earl on yesterday’s blog this morning because I still didn’t get today’s again but I do not see it posted. Wanted to say thanks for correcting me, and the history lesson with English to boot. I got out the dictionary for pedantic. Forgot that fact about Clinton. Until tomorrow stay well. Hi, all! With 3 people looking up, the answer was immediate, and the PICKY MONKEY of the GROUP who did not want to eat a MUSSEL was a fast solve, also. A friend once told me that he liked to look up & point straight up for no reason and watch other people look up. Hi, Steve! Garfield & Jon, ordering soup for lunch, are told by waitress that the new cook graduated from The Institute of Advanced Bachelor Cuisine. Their soup arrives in opened cans with the ragged edged lids sticking up still attached and a straw in each can. Too funny! “Clean house” day for me because after inviting family to “Celebrate Jerry” day tomorrow, I also invited some friends & neighbors, especially the boy next door who put our garbage thingie out every week for 3 months. Hi Lelia – Very funny. One of Jon and Garfield’s Rules for Bachelors is “never look up!” When you do, you see the cobwebs on the ceiling. Hi, Steve! Thank you for the extremely informative and poignant Marleau article. I learned that he is Canadian through & through, that playing for the Maple Leafs is the dream of every young Canadian ice hockey player, and that the game is woven into Canada’s fabric. Wow! A comic this week showed a mother yelling at her son to remove the huge spider he had hung from the ceiling above the dining table. He calmly walked over & pointed to a real spider on their ceiling that she had not removed. Funny! Your dinosaur skeletons pointing at the sky, confirming the asteroid theory, made me smile and reminded me of our 3rd grade science lesson about the different theories concerning the demise of the dinos. Hi Lelia – the Marleau article also led me to discover that almost all of his home Province of Saskatchewan does not observe Daylight Saving Time, just like Arizona! Second time I’m trying this….. In the Japanese Snow MONKEY GROUP, the females are very PICKY when selecting which MUSSEL shells to collect and break open. Easy solve for me this early AM—words and solution. Getting access to this blog was impossible until after 3 PM. Almost gave up and I’ll now stop any further complaining. What do you mean by getting access, Earl?